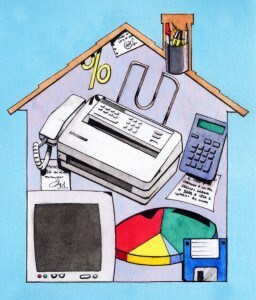 Home · Property Management · Tax Tips : Can I Take the Home Office Deduction? Can I Take the Home Office Deduction? The home office deduction is a confusing topic for many taxpayers. Can I only take it if I am self-employed? What if you’re not self-employed, but work at home frequently? And isn’t it true that the IRS is more likely to audit you if you take the deduction? Because of these types of concerns and questions, many taxpayers that are entitled to this deduction do not take it. The home office deduction may be taken by anybody who uses their home, or part of their home, for business purposes. The IRS does have strict regulations that must be met to qualify for the deduction. As a place to meet or deal with patients, clients, or customers in the normal course of your business. Exclusive is a key term in determining if you qualify for the deduction. By exclusive, the IRS means that the part of your home you are deducting is used only for business. Because of the above two restrictions, it is usually much easier for self-employed workers to take the home office deduction, assuming they have properly set up an area of the house which would qualify. However, if you are an employee who works at home, there is also a chance that you may qualify. In order to qualify, you must meet the convenience-of-employer test. This essentially means that the work you do at home must be at the request or convenience of your employer. If this is the case, you may qualify for the deduction assuming all of the other rules regarding exclusivity and regularity are followed. There are two types of deductible expenses relating to the use of a portion of your home as a home office”direct and indirect expenses. Direct expenses relate to the actual work space. This includes repairs and paint inside your home office. Indirect expenses relate to the house that the office is inside and are only partially deductible. Utilities, insurance, and mortgage interest are examples of indirect expenses. These expenses are only deductible based on the square footage of your home office to your total home. For example, if your office is 20% the square footage of your entire house, you can deduct up to 20% of your indirect expense as a home office deduction. ACTION ITEM: We have all heard that taking a home office deduction will lead to an audit, and because of this, many taxpayers have decided that it is not worth the supposed risk. This could be a mistake. Any deduction you are entitled to, you should take. If you keep accurate records and meet all the IRS regulations for the deduction, you should discuss this deduction with your CPA. Thomas F. Scanlon, CPA, CFP. is with Borgida & Company, P.C., Certified Public Accountants in Manchester, Connecticut, celebrating 44 years of tax, advisory and accounting services. Call 860.646.2465 for more. For tax advice from Mr. Scanlon, see Landlord Quick Tip.